However, it seems he is very selective in applying “sound science” to certain issues. Consumer rights groups in the US are pushing for the labelling of GMO foods, but Vilsack says that putting a label on a foodstuff containing a genetically modified product “risks sending a wrong impression that this was a safety issue.” It is highly convenient to parrot the slick PR claims of the powerful GMO biotech industry. Science does in fact show that GMOs are indeed a big safety issue and what’s more are also having grave environmental, social and economic consequences [eg, 1,2,3,4]. By not wanting to respond to widespread consumer demands to know what they are eating and risk “sending a wrong impression,” Vislack is trying to prevent proper debate about issues that corporate backers would find unpalatable: profits would collapse if consumers had the choice to reject the poisons being force-fed them. Coming from the GMO biotech industry, or its political mouthpieces, the term “sound science” rings extremely hollow. The industry conceals the data produced by its research under the guise of ‘commercial confidentiality’ , while independent research highlights the very serious dangers of its products [6,7]. It has also engaged in fakery , bribery  and intimidation  as well as the the distortion  and censorship of science . If “sound science” is to be held in such high regard, why resort to these methods? The answer is because the GMO biotech industry cannot deal with science when it really is ‘sound’ and would not win any debate that is genuinely scientific, least of all because there is no scientific consensus in favour of GMOs, despite the pro-GMO lobby often claiming otherwise. While there are demands for strong rules for confidentiality of business information within the TTIP, biotech, pesticide and food lobbies have made their opposition known to an initiative by the European Food and Safety Agency to facilitate public access to data from safety studies done by the industry . The public has for too long been kept in the dark about industry-backed ‘science’ that has been used to gain regulatory approvals to get its products onto the commercial market. As CEO argues, when US farm lobbyists push for “sound science” as the basis for food supply trade rules, what they mean by this term is that they want Europe to eliminate all restrictions on imports of food from the US and to adopt a US-style food supply regulatory regime, stripped of the precautionary principle. US corporations want to make it difficult for European consumers to identify whether what they’re eating is food that was produced using health-damaging practices EU consumers are against, like GMO maize, chlorine-washed chicken and meat from animals treated with growth hormone. 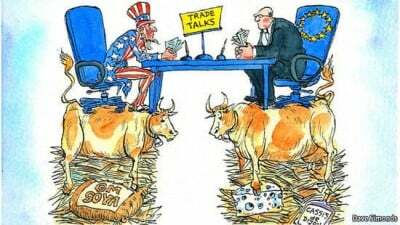 The food and agriculture trade provisions of TTIP will affect almost everyone in Europe. We can only hope that proper precautionary measures are made more robust and science which is genuinely sound prevails.